Trying to protect your equipment, no matter what industry you work in, can be difficult. Environmental factors, along with whatever chemicals or conditions your work brings you into contact with, can cause faster degradation that may cost your business money in replacements, repairs, and downtime. At IXS Coatings, we knew that there was a way to help many different industries through the application of polyurea protective coatings. 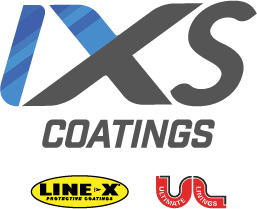 IXS Coatings is a partnership between two giants in the protective coatings industry — LINE-X and Ultimate Coatings. With more than 50 years of combined experience, we have the knowledge and materials necessary to help your business maintain safer, longer-lasting equipment with spray-on polyurea coatings. Read on to learn about the steps we are taking in a number of industries to protect projects already in the works and those in the planning stages. Contact us today to learn about the many different ways we can have a positive impact on your business. IXS Coatings has several protective coating options that will make your work in every part of the gas and oil industry safer, more efficient, and more cost effective. From spray-on tank liners that extend the life of tanks by preventing or slowing degradation caused by weather and chemicals to pre-sprayed geotextiles for secondary containment systems and pipeline coatings that fight against rust and other forms of corrosion, our protective coatings can save you time and money. LINE-X’s PAXCON® spray-on coatings provide unsurpassed protection for military and defense personnel as well as armored vehicles in-country and abroad. Using the latest technology, these coatings help save lives and equipment. From the most trusted spray-on bed liners in the world to RV and UTV coatings, IXS offers solutions for every kind of vehicle. Our coatings have been used to great effect in vehicles that deal with extreme conditions as well as vehicles that haul chemicals. If your fleet needs unbeatable protection, LINE-X has more than 600 locations that are ready to meet your needs. From spray insulation to roof and parking lot coatings, IXS can handle your construction needs. We utilize a number of different chemicals and processes, including polyurea and polyurethane foam, in order to help you protect almost any surface from scuffs, scrapes, water damage, and more. We even offer foam options that can be used to lift sinking concrete slabs. No matter what kind of business you are in, if you need to protect your vehicles or equipment from damage, IXS Coatings has options available. From protecting boats to first responder vehicles, there is nothing that we can’t help to last longer. Contact us today to learn more about the many ways that we can help protect your equipment, vehicles, and tools from environmental and industrial damage caused by normal wear and tear or accidental exposure. We are dedicated to helping all of our clients find the most cost-effective ways to make their assets last longer.